Sauerkraut is not Russian in origin, but like most ancient dishes of Europe and Asia, it has taken root and developed a distinct flavor of its own in Eastern Europe. It’s very simple to make, but requires up to a week of preparation. However, you can make a lot at once and it’ll easily last for a month in the fridge. It is commonly served as a side or used in salads and soup preparation. From personal experience I find Russian sauerkraut to be sweeter than other European varieties. 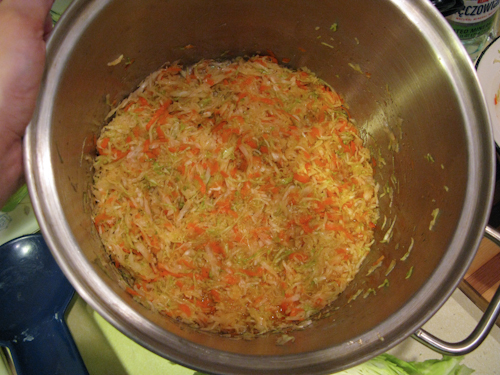 Prepare as much sauerkraut as you please, but we typically make a lot at once since it takes a little bit to ferment. We worked in batches of 0.5 heads of cabbage to keep the mess down. 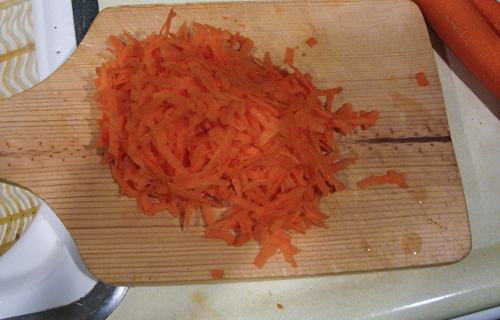 Coarsely shred/slice the cabbage and carrots. Combine in a large bowl with the salt and sugar. 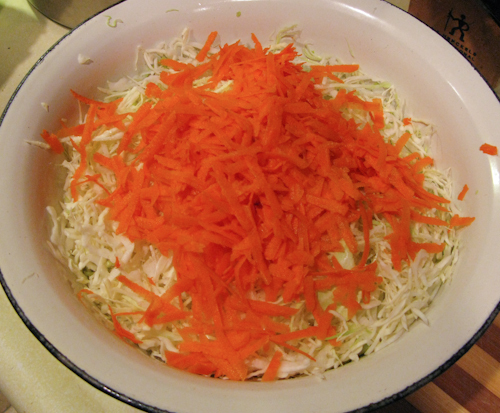 Using your hands, crush and mix the mix to release the juices from the cabbage and carrots. Add the cranberries. 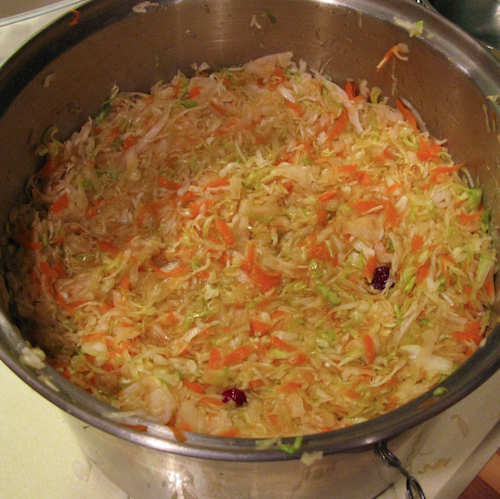 Place the mix in a large pot and pack it down (key is to get as much cabbage submerged as possible). Add additional layers cabbage as needed; we used 2 whole heads of cabbage in this preparation. 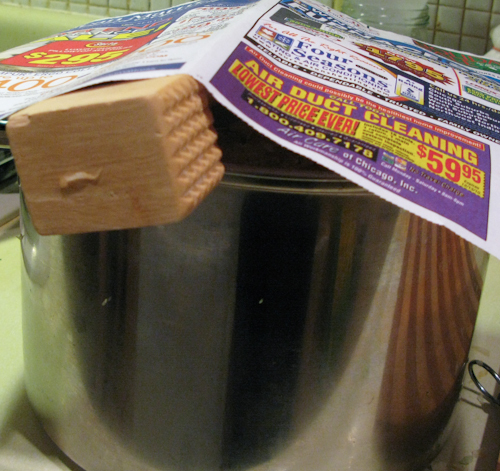 Cover the pot with cheesecloth, or you can improvise as we did. It’s important to the cabbage breath. Set aside at room temperature for 1-1.5 days. 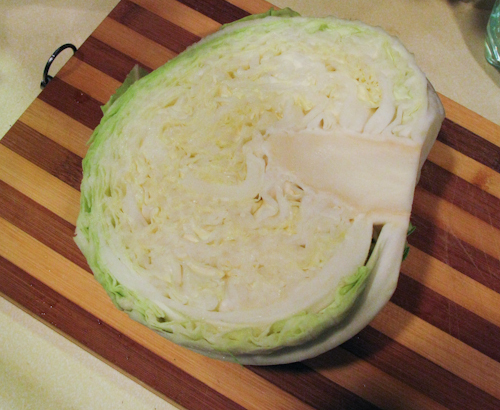 Once you see some bubbles forming (sign of fermentation starting), use your hands to turn the cabbage over, brining the layer on the bottom to the top. 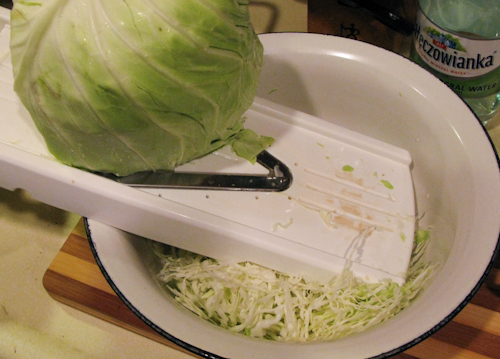 Compact everything down again, and use the handle of a spoon to poke 3-4 holes in the cabbage going all the way to the bottom. This is needed in order to release gases formed during fermentation. Cover again with the cheesecloth. Do this every day, making sure to check how it tastes. 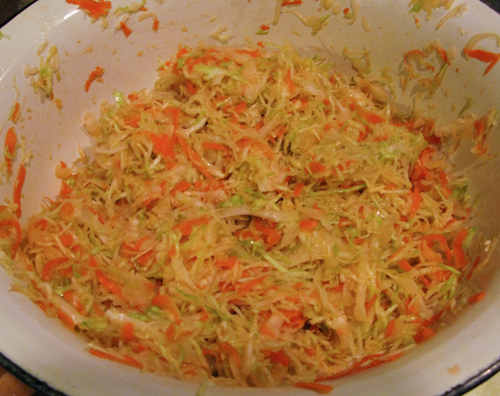 It can take up to a week to ferment the cabbage to the desired flavor. 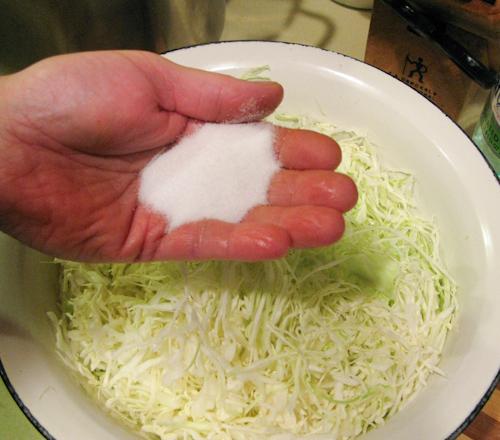 Once it has the distinct sour-sweet flavor, transfer the sauerkraut to a sealable container and refrigerate. Posted in: appetizer, Holiday, meat-less, salad.